The following picture has a number of tips regarding the use of Apple Remote Desktop to deploy the Monitoring Client. Here we see that installation can be handled with a single command, sent as root. Then installer is invoked to finish the deployment. Finally, the source pkg is removed. 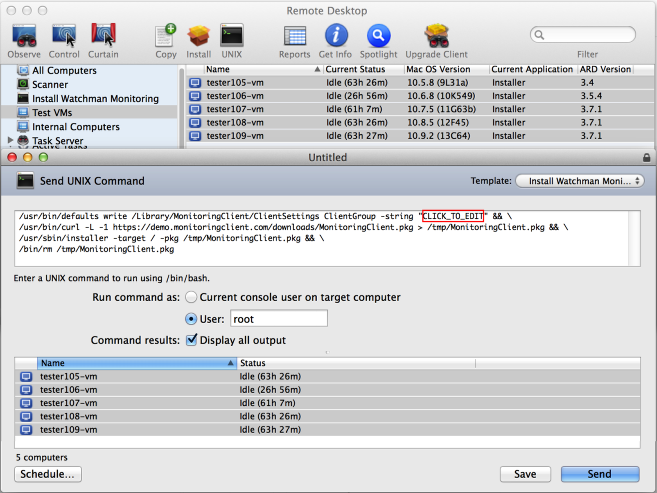 This command can be saved as a Template in Apple Remote Desktop, allowing on-demand deployment of the latest client whenever the need arises. To the left, below the Scanner in the list, we've saved the Send UNIX Command, making installation a drag-and-drop action for any Mac running 10.5 or later. Visit: https://app.monitoringclient.com/installers/mac#scripted and scroll to Scripted Background Installation to get your customized script. Fill in the desired group name then copy the text for use in Remote Desktop. We've designed the Watchman Client to be as administrator friendly as possible.